The Under Secretary of Defense (Comptroller)/Chief Financial Officer, abbreviated USD(C)/CFO, is a high level civilian official in the United States Department of Defense. The Under Secretary of Defense (Comptroller) is the principal staff assistant and adviser to both the Secretary of Defense and the Deputy Secretary of Defense for all budgetary and fiscal matters, including the development and execution of the Defense Department's annual $600 billion budget. The Under Secretary is appointed by the President and confirmed by the United States Senate to serve at the pleasure of the President. The position of Defense Department Comptroller was originally at the rank of Assistant Secretary until the National Defense Authorization Act of 1995 upgraded the position to its current rank of Under Secretary. The Office of the Under Secretary of Defense (Comptroller) is the principal staff office for the Defense Department on all budgetary and fiscal matters, including the development and execution of the Defense Department's annual budget of more than $600 billion. As Chief Financial Officer, the Under Secretary's Office also oversees the Department's financial policy, financial management systems, and business modernization efforts. The Under Secretary is chair of the Financial Management Modernization Executive Committee, which has the goal of making sure that each of the Department of Defense's critical accounting, financial, and data feeder systems are compliant with applicable federal financial management and reporting requirements. The Comptroller is also a member of the Defense Business System Management Committee. With the rank of Under Secretary, the USD(C) is a Level III position within the Executive Schedule. Since January 2010, the annual rate of pay for Level III is $165,300. The Principal Deputy Under Secretary of Defense (Comptroller), abbreviated PDUSD(C), is the USD(C)'s chief deputy and assumes the duties of the USD(C) in his absence. Pursuant to Public Law 111-84, the PDUSD(C) is appointed from civilian life by the President of the United States with the consent of the Senate. The annual budget for the USD(C) is contained in the Office of the Secretary of Defense's (OSD) budget, under the Defense-Wide Operation and Maintenance (O&M) account. Comptroller Initiatives - Support for producing and providing senior Department leadership with authoritative, accurate, and timely financial statements and support Department-wide business transformation efforts by improving financial management processes, systems, and financial reporting. This funding appears to support the programs of the Defense Contract Audit Agency and the Defense Finance and Accounting Service. John J. Hamre October 26, 1993 - September 5, 1994 Leslie Aspin, Jr.
↑ "US CODE: Title 10,135. Under Secretary of Defense (Comptroller)". http://www.law.cornell.edu/uscode/html/uscode10/usc_sec_10_00000135----000-.html. Retrieved September 23, 2007. ↑ "Search Results - THOMAS (Library of Congress)". http://www.law.cornell.edu/usc-cgi/get_external.cgi?type=pubL&target=103-337. Retrieved September 23, 2007. 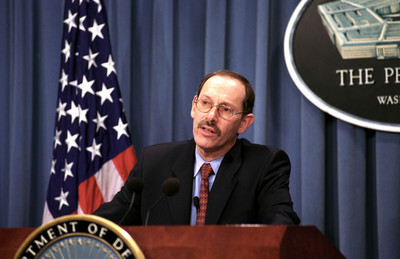 ↑ "Robert F. Hale, Under Secretary of Defense (Comptroller) and Chief Financial Officer", Official Biography, Officer of the Secretary of Defense, United States Department of Defense, Washington, D.C., 25 April 2009. ↑ "US CODE: Title 10,185. Financial Management Modernization Executive Committee". http://www.law.cornell.edu/uscode/search/display.html?terms=military%20or%20cum%20or%20martial&url=/uscode/html/uscode10/usc_sec_10_00000185----000-.html. Retrieved September 23, 2007. ↑ "US CODE: Title 10,186. Defense Business System Management Committee". http://www.law.cornell.edu/uscode/10/usc_sec_10_00000186----000-.html. Retrieved September 23, 2007. ↑ "Department of Defense Key Officials". Historical Office, OSD. 2004. http://osdhistory.defense.gov/docs/DOD%20Key%20Officials%201947-2004.pdf. Retrieved 2011-02-01.